One of the larger types of Mantis this beautifully coloured insect has a diet of flies and small bugs. They have very powerful limbs which enable great stability and the power to catch their meals no matter how wriggly they are. 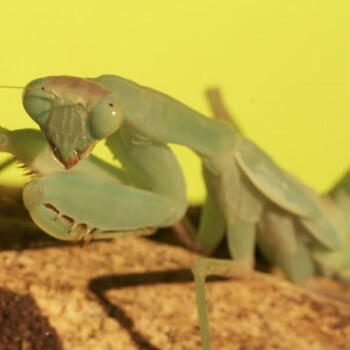 The name praying mantis comes from the position the insect sits when at ease, with both limbs making it look like its praying. One of the most popular facts about this species is that they eat the male after they have mated. Yummy. There is a reason for this, all the nutrients from the male will help the female to be a successful ootheeca (egg sac) layer and will successfully create a new generation.